Jesus said, “My sheep hear my voice.” If you’re a Christian, you can hear God’s voice. Why do you think he created Adam? He wanted someone to talk to. God loves to talk with his children. But how do we know when he’s speaking? How can we recognize his voice? It would be so much easier if we just had a burning bush. In this video we’ll talk about the different ways that God speaks and how you can train your ear to hear his voice speaking directly to you 1:1. Just click on the video and open up to a closer relationship with God. To live a transformed life you must learn to hear God’s voice. 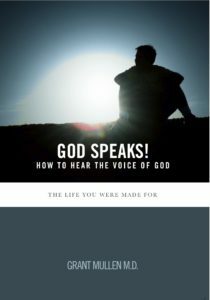 In this 5 part video series and workbook, you will learn how to recognize and hear God’s voice. It’s designed for personal or small group study. 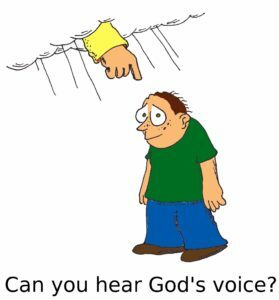 How can you tell when God is speaking to you? Just leave your comments in the box below. I had an answer from God on Easter Friday morning as I was sitting in Church. The worship leader had said something the I immediately felt a disagreement in my spirit over but couldn’t discern if my thoughts on the issue were correct or not. I asked a pastor friend of mine if I could talk to him after the service. Then the last song we sang answered the question for me. The issue became clear for me. God is always so good. He never leaves you wondering about the real important stuff. Dia duit(hello in Irish means God be with you) Grant that was really good well done. Over easter im really starting to hear Gods voice clearer and feel an amazing sense of peace. I just pray everyone in the world gets to feel this way. Life is so busy its hard to slow down and listen. Im going to Lourdes next week so I cant wait for that week of peace alone please God. Im so thankful for the life ive been given I hope to make the most of the rest of it almost 29 years are gone but I loved them. Being with family and caring for young and old it really kept me happy but now I would love to look after as many people as possible Id like to help run an orphanage and have all the children possible in it and give them a brillant start in life. A priest blessed me on Good Friday and he prayed for me to have strength and I really feel it was answered. Great things are happening in my life. I am in the process of selling my commercial building which I had prayed to do for 5 years; i am very happy that Stephen Harper won a majority conservative federal election on Monday among other good things. still, i got this depressed lonely feeling again yesterday. I went for a walk. I asked God what to do about this recurring negativity. WARFARE came to mind. This is the enemy, Satan. He has no legal right to my mind because of what Christ did on the cross, and I am His. My part is to use my authority in Christ and excercise my authority over him, and use my weapons on him. Claim scripture such as I have been crucified with christ and i no longer live, but Christ lives in me. And the life i now live I live by faith in the Son of God who loved me and gave himself for me. Graham Cooke speaks about being eager to fight the spiritual battles instead of running away or hoping the battles are over. Dutch Sheets in “Intercessory Prayer” says that Christ in his work of intercession defeated Satan. Our part is to enforce it…tell Satan that I know this…tread on him…wear my full armour use my powerful weapons designed to overcome the kingdom of darkness..the sword of the Spirit, shield of faith, helmet of salvation, breastplate of righteousness etc. Grant Mullen I am reminded of your lesson about our soul (always remembering past hurts) and our spirit getting along well only when things are going my way. Sometimes my spirit needs to duct tape my soul’s mouth! I was really surprised on my walk yesterday that I had never before recognized the source of my dejected, lonely feelings, but thought I had to put up with this. I calmly told satan to leave (claiming the above) and had a good productive evening. Thanks for these great comments. God sure does speak to us and in so many different ways. Your sharing today was great, I thought. Another way that has been meaningful to me comes from Col 3:15. Let the peace of God rule (umpire) in your hearts,– A sense of uneasiness in your spirit indicates a flag to a particular activity. ps who is next in line to the throne is it Prince Charles or William? Ah thats a good one Snowden Eisenhour lately, kind of since May day I think. I feel like my hearts about to burst out of my chest when i think of God and when I see the river and mountains and stars and sunset and sea and forest all the amazing things we can experience for free. I just am fully seeing how amazing the world is I look forward to the day every person on earth can have everything they need and theres peace on earth God bless all who want to do harm especially people with such power as Gaddafi and may there hearts soften and let them only want to see hear speak and do good. I have heard God speak so audibly that I was looking around for someone hidden behind a tree as I was walking in the woods at the time. He has also spoken to me while I was napping. I had a job to do for the kingdom and I was upset about how to go about it. I seemed that Jesus was there beside my couch and told me what to do step by step. This worked out just wonderfully when I woke and wrote it all out. Wow! That’s amazing Allen. Not many of us have had that experience. Dr. you always have amazing lessons to share with your viewers. We appreciate it! I know that in my life I get so busy trying to work out other people’s (mostly family members) problems that I don’t take the time to get into scripture. I know that all my anwsers are there. When I read scripture, I have a difficult time figuring out what I’m reading, and retainiing it is another difficult thing for me. I know exactly why I’m having these troubles, it’s because my mind is racing on what I have to do for the next battle I have to deal with. I can’t sit still, I don’t know how to meditate! I am so frazzled and don’t know what to do to change my habits. I know it’s going to take God to help me, it’s going to take me letting Him. I just don’t know how! Pray for me, please! (I’ve always taken charge in caring for all my siblings, grandparents, parents, nephew’s and even personal friends at home and some at church). Is it so wrong to care? Have I taken it to an extreme? Good advice, for sure. If more of us learned to seek God through His word, His Spirit, our circumstances and others, we’d know and trust Him more. For too long we’ve done it the other way around and wondered why we were messed up. Oh our God is loving and patient! I love hearing the voice of God and I have often prayed and asked God to help me to never take it for granted.Just last week I called my counselor’s office for an appointment and found out she’s booked for a while. I hung up, prayed and asked the Lord for favor since it was a little urgent, and left it in the hands of God. Not too long after that I heard the Holy spirit say, not audibly, but in that still, small voice that Monday at one o”clock will be available. So I thanked the Lord and waited. Sure enough, the receptionist called and said Monday was available, but at five o”clock.So I said okay and thought maybe I hadn’t heard the Lord correctly. Minutes later, the phone rang and she called to say she had made a mistake and IT WAS INDEED one o’clock that the counselor was available.Praise God for the Holy Spirit who dwells in us and speaks to us . To God be all the glory. I stand in awe of Him!! By the way, I loved this video.!! I, too, love the video — and the shirt! I have heard the Lord speak to me audibly a few times and when that happens, it seems to be coming from every direction both inside and out simultaneously! It’s pretty amazing. Other times, that beautiful still small voice and sometimes by journaling also, tho’ not lately. Sometimes I barely get the sentence out and it is answered. Often I forget someone’s name and I ask Him and it is there, or I can’t find something and I ask Him and he leads me to it. He really does want to interact with us much more than we realize or allow Him to. The second time I heard the Lord’s audible voice, he said to me “PLEASE LET GO.” This was quite a few years ago now and it is something I am still trying to do … something we must ALL learn to do. If we desire the Lord to use us, then we must give up our own way and allow Him to have His way in and to and through us. My faith is growing with every comment. Hearing the audible voice of God and actually getting the time of a future appointment!! That’s amazing and beyond most of our experiences. Thanks for sharing and raising our level of expectation of how much God wants to speak with us. Thank-you, Dr. Grant for this excellent explanation. I have had answers and impressions in my thoughts with my tone of voice that I knew were not from my brain but had to be from God because they were unexpected and they worked! Also, thanks to you, I rediscovered a pamphlet I got from church by Mark Virkler with the four keys to hearing God’s voice. Plus meds don’t prevent me from hearing from God, thank-you Jesus and Dr. Grant! I practice hearing from God by asking him to help me remember why I walked down stairs and for what am I looking for. He will put that thought back to work in my mind of what I walked downstairs to get. I then thank him. I will not hear from God right away sometimes I just let it go. Maybe I don’t need to hear from him for this question. It is a yes? sometimes thoughts and feelings may come from our sinful nature and for other reasons and then I blame myself and become depressed very easily. I feel very alone sometimes with these feelings, Then I think saton uses this with lies and condemnation. God reminds me that I am a new creation and He has a purpose for my life. I know God wants us to obey His teachings and with any problems God reminds me He loves me unconditionally and He will help me. Its hard to stayed focused on this when the worlds thoughts sometimes are not His ways and this can be confusing. I have to say over the years there has been some precious moments where He has guven me words at the right time and has clearly spoken to me with his still small voice. One time I was so overwhelmed and with a loud autible voice inside my mind said I will never leave you or forsake you. Many time Iv;e gone to bed and have asked Him to speak to me and i would wake up with a song or scipture ngoing through my mind like I am strong when I am on your shoulders you raise me up to more than I can be. Sometimes my mind is raising with anxious thoughy and it is like God in the middle of this stops the tape okayer of my mind to help mr, As if to say hold it a minute I will help you and I want to speak to you. How comforting. At these moments too I have sensed His actual presence with me even though visually you cannot see Him. I hace also experienced His correction and conviction as a father would to a child. I often hear God’s voice through scripture. I ask the Lord to show me what I need to see in His Word. Sometimes He even directs me to a certain passage of Scripture. He will often replay these passages of Scripture over and over in my mind. Sometimes He speaks through other people especially if I need confirmation or puts a thought in my mind and then backs it up with Scripture. A daily, continuous conversation with our wonderful Heavenly Father?, wow, what an amazing way to live! I think of Enoch…no Bible, no church, no help books, no seminars…but a dynamic, daily conversation with God for 365 years!…I’m sure he never got bored…neither did our Father who decided that since He and Enoch were enjoying this so much they may as well be together!… so He took him…yea, like, to heaven. Dr. Mullen, this edition on hearing God’s voice is brilliant. You ask for suggestions? I feel a little speechless other than saying each day I am at a 5am to read the Word of God and pray. I ask God to speak to me through His Word. I pray for so many people that I use lists for each day. This is not because I am bound by ink and paper, but because it keeps me from forgetting. Thanks for such a helpful and practical presentation. I have already forwarded it to several friends. A daily, continuous conversation with our wonderful Heavenly Father?, wow, what an amazing way to live! Yes that’s it. That summarizes my video. Dr. Mullen thanks again for another practical message on an important topic………It is all about our relationship with the Heavenly Father, His Son, and the Holy Spirit.What could be more important than Knowing His voice especially through scripture……….He’s coming back!